MAFWDA Potomac State Forest Volunteer Weekend | Capital Off Road Enthusiasts, Inc.
Every year CORE participates in a volunteer weekend at Potomac State Forest, hosted by the Middle Atlantic Four Wheel Drive Association (MAFWDA). The event is hosted by the Director of Land Use for MAFWDA, Preston Stevens. 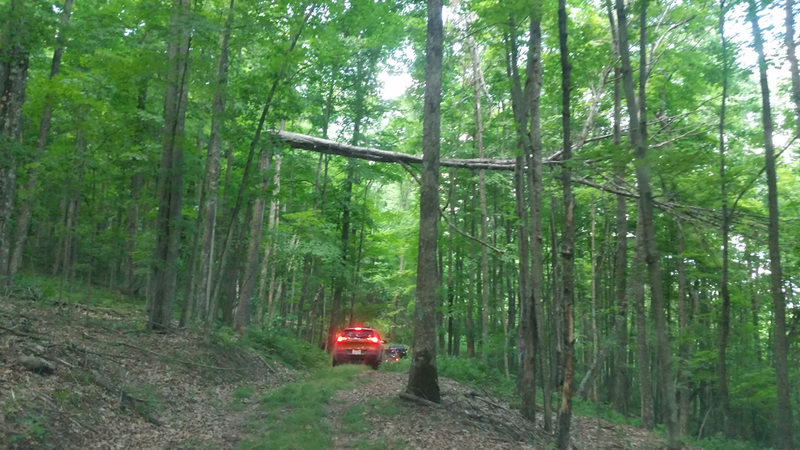 Preston works closely with the forest managers to put together a project each year that helps us give back and foster a great working relationship with local land managers. 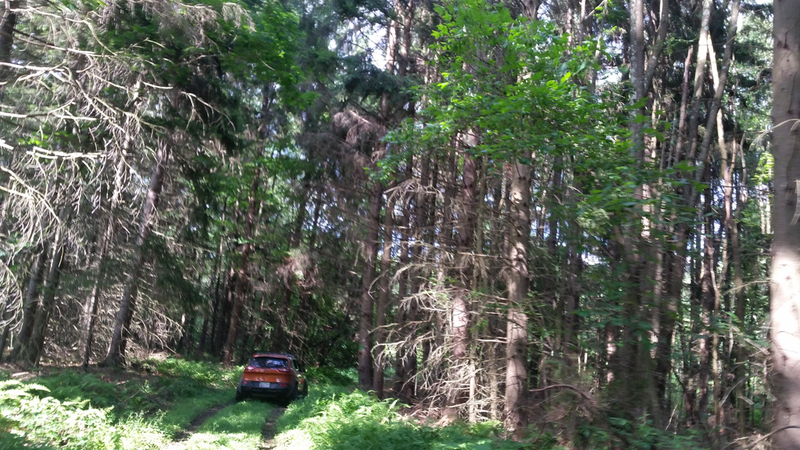 We are also given special access to trails for the weekend that would otherwise be closed to 4×4 access. 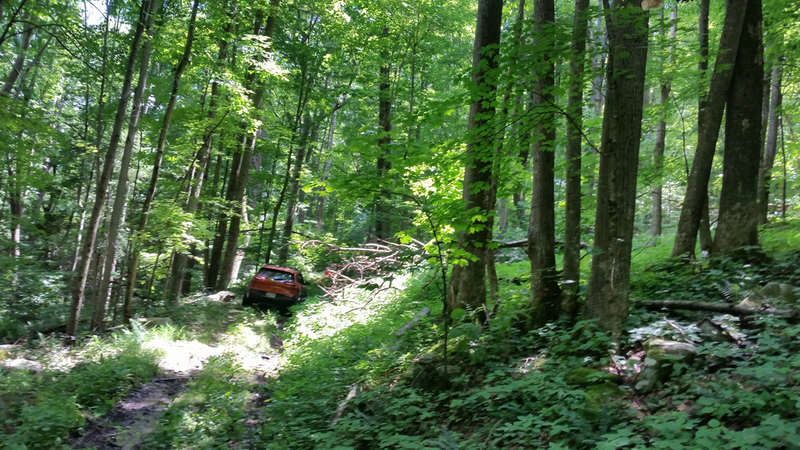 After trying several times the truck slipped over the side of the trail and ended up in the woods – very close to slamming into the side of a tree. We arrived at camp on Friday afternoon. It’s unusual for us to set up a tent in the light, so it felt great to take off work a few hours early and head into the mountains. The weather was absolutely perfect all weekend and it made for a great weekend to camp! Every year Preston gets the same group site in the forest, which is large enough to hold several campers and lots of tents. And it’s right near a vault bathroom! We set up camp and sat around the fire as others trickled in to the campsite. Fred and Robert arrived just before dark and everyone had a great time sitting around the fire and catching up. Saturday morning we all woke up bright and early. We planned to be headed out by 9 am to start our work. The forest manager had tasked us with painting the yellow gates used to block trail access. Over the years the paint flakes off and dirt and rust take its toll. We split up into two teams, each with a box of sanding gear, face masks, paint brushes, and paint. Our group consisted of all of the CORE crew and Tom & Deb. We set out with our box and drove down to the first gate we could find. We all began sanding the old paint off. We quickly understood why they had face masks in the box – the yellow dust got everywhere! After we finished the first one, we decided to leave Tom & Deb behind to paint while the rest of us moved on to start sanding the next gate. We took turns sanding and painting each gate. Before we knew it it was noon and we were wrapping up our fourth gate. We packed up and headed back to camp for lunch. Shortly after the other group came back and said they had also completed four gates! Not too bad for a few hours work. After lunch we decided to go for a trail ride. 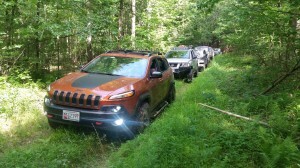 Each year Preston takes a group out after volunteering and heads down a few of the special access trails. This year we decided to hit a few of the snowmobile trails and had a great time. The trails were fairly dry since we hadn’t had any rain, but we still managed to have a few interesting moments. Not too far into the first trail we came across a downed tree on the trail. We decided to drive over it slowly and one by one we made our way across. Unfortunately as Shawn approached the downed tree in his Jeep Cherokee Trailhawk he didn’t quite have the wheel travel to keep himself steady and quickly slid down the trunk and off the side of the trail. A few more attempts at correcting his course put him even more off the trail. 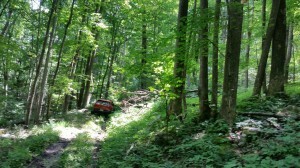 Andrew ending up hooking him up to his winch and slowly pulling him back on the trail. The last little bit require a strap to be hooked up but he was quickly back where he needed to be. Meanwhile, Preston had started up the chainsaw and made sure the downed tree was clear of the trail. 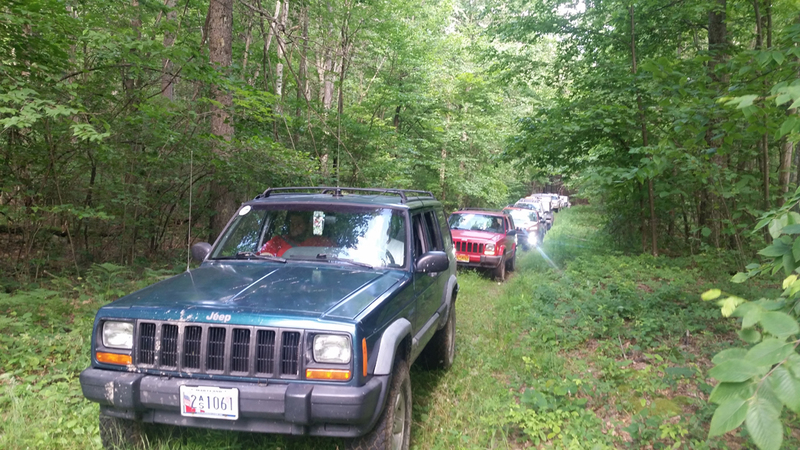 Later on we came to an incredibly long hill climb that was fairly muddy and rutted out. We each made our way up the trail with a bit of momentum and made sure to wait until the truck in front of us had made it up the hill. After Andrew and I made it up we called down to Fred & Robert that it was their turn. We waited and waited and their truck never came up. We called down on the CB and got no response. Andrew jumped out and decided to head back down the trail. The next 45 minutes were interesting. Robert and Fred were having trouble making it up the hill and kept getting stuck in the same spot. 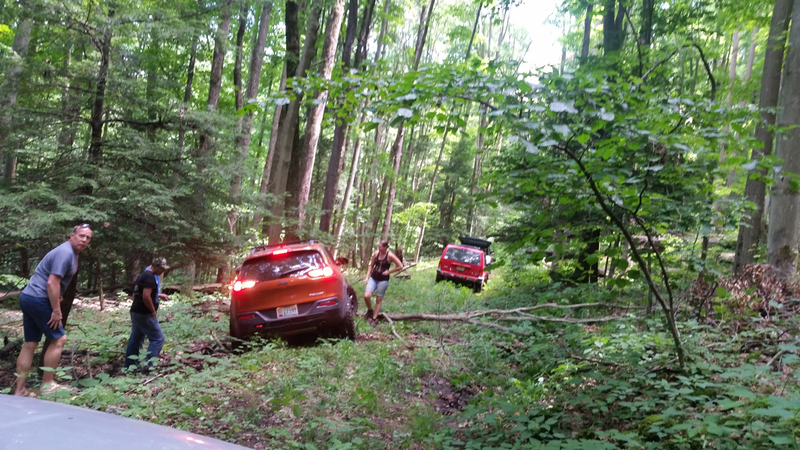 After trying several times the truck slipped over the side of the trail and ended up in the woods – very close to slamming into the side of a tree. It took a group effort to maneuver all of the trucks around that spot and up the hill, until Tom & Deb in the Bronco could get to them to hook up. 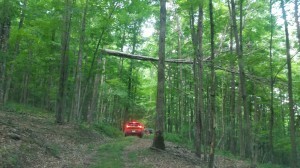 They were able to pull them back on to the trail and everyone else was able to make it up the trail with a bit of work. Several people learned the value of airing down on that one! The rest of the trail riding went smoothly and it was such a beautiful day! When we got back to camp we even set up the camping hammocks and took a wonderful afternoon nap! That evening the CORE group decided to try something a bit different and head into town for dinner. We never took the time to explore the area and thought it might be fun to check out a local restaurant. 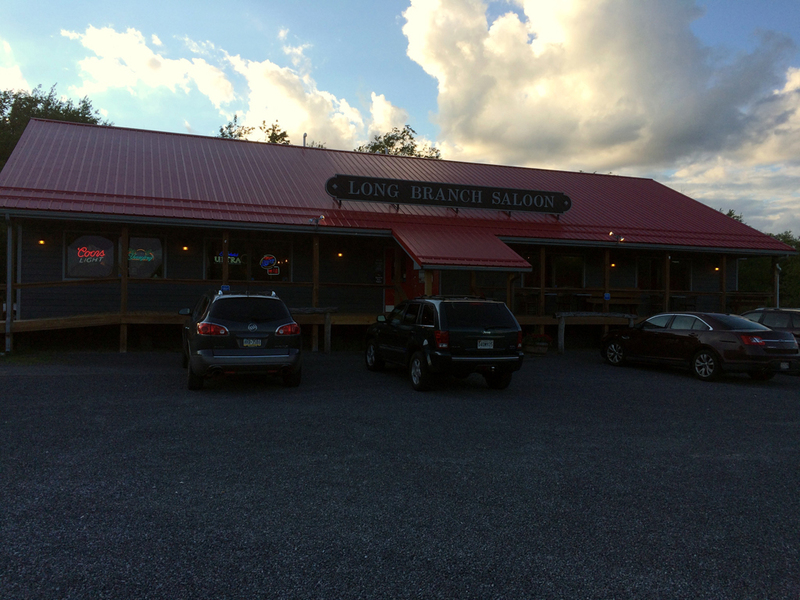 We decided to go to Long Branch Saloon, about 20 minutes up the road. The drive was beautiful and the mountain tops were lined with huge windmills. We all got big steaks (with lots of leftovers for Trudi) and amazing desserts and had a great time. We were all pretty beat after a long day and it felt good to crawl into the tent and get some sleep. Sunday morning we unfortunately all had to pack up pretty early and head out. 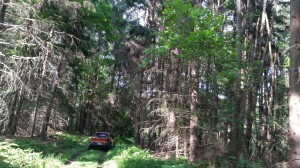 It would have been great to hang out all day and enjoy the forest, but life happens. It was a really great weekend for camping and trail riding. The weather was perfect, despite a rainy forecast, and it was fantastic for camping! This trip is always a highlight each year and it is so important to participate in these positive land use activities and work with local land managers to protect our valuable resources. 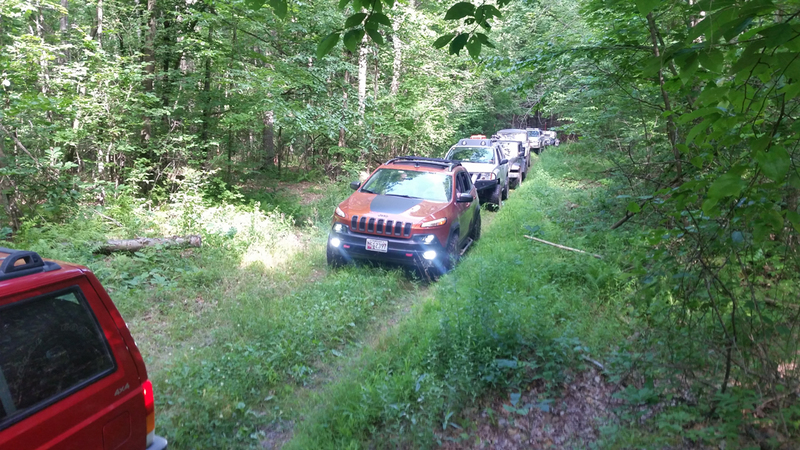 We truly appreciate everything Preston and the Middle Atlantic Four Wheel Drive Association does in developing and maintaining these relationships with local land managers and advocating for our cause – especially when it involves a fun weekend camping and wheeling! Trail report written by Cherie Taylor. Pictures courtesy of Cherie & Andrew Taylor, Fred Granruth, and Robert Rixham. Trip Report MAFWDA, Potomac State Forest, Volunteer. permalink.